One of Queensland’s most popular camping grounds, Amity Point on North Stradbroke Island, is developing new eco-accommodation prototypes. 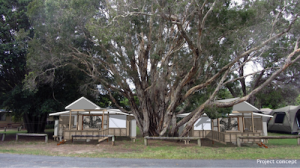 Straddie Camping Chairman Cameron Costello said a major capital works program, which initially involves the removal of two cabins and the construction of new eco-accommodation prototypes commenced last week. In a first ever partnership, the old cabins are being relocated to replace well needed housing at Myora Caravan Park, which is managed by the North Stradbroke Island Aboriginal & Islander Housing Co-Operative Society Ltd.
“The Amity Eco Project is part of Straddie Camping’s overall sustainability strategy to improve the North Stradbroke Island camping holiday experience and to present the camping grounds in such a way that the nature and culture of North Stradbroke Island is celebrated and respected,” said Mr Costello. The prototype eco-shacks will be built with local expertise and draw inspiration from traditional Australian tent styles, and the quintessential North Stradbroke Island fishing and beach shacks, whilst integrating the Quandamooka people’s cultural considerations to land, seasons and wildlife. The eco-shacks will feature large windows and will be architecturally positioned off the ground to take advantage of the island breezes. They will face Moreton Bay, and their off-the-ground elevation will provide spectacular views of the sun setting over the water. The prototypes will utilize environmental best practice technology in the generation of power, treatment of water and sewerage, and ensuring a minimal environmental footstep, and each eco-shack will have a tank to harvest rainwater for internal use. The eco-shack structures will be market tested, evaluated, and fine-tuned, for possible use in clusters within Straddie Camping’s other camping grounds on North Stradbroke Island. “This project highlights that we have the capacity to develop pioneering initiatives in this field and to play an important role in the development of Aboriginal tourism in the region,” said Mr Costello. The prototypes are due for completion by late October, and prices will start from $200 per night. The project is supported by T-Qual, a competitive merit-based grants program overseen by Austrade, aimed at stimulating sustainable economic growth in the Australian tourism industry.